Art Activities for Kids - Our Top 10 All-Time Favorite Kids Art Activities! ​For years now, I’ve been working on this list of favorite art activities for kids. Every time we try a new art activity, or even revisit an old favorite, it gets measured against the list in my head. Who wouldn’t want to do those activities?! So, today, I’m going to share my top 10 list with you. This is an all-time favorite kids art activity that is loved by all ages from toddlers on up. Plus it uses materials you already have! Glue, salt, and either liquid watercolor paint or food coloring. Combine the vibrant colors and smooth application of oil pastels with baby oil for a painting effect. Make beautiful flower or leaf suncatchers to hang in the window! This spring or summer craft uses a paper plate as the frame for a nature suncatcher that anyone can make. Try melting crayons art on canvas panels then add watercolors for a vibrant watercolor resist artwork. This art project is equally great for kids and adults. Note :: Here are 6 more great watercolor resist techniques to try. A drawing game for kids or kids and adults that allows each person to build off of the previous persons drawings. Low key yet interactive, this back-and-forth drawing game is a fun way to connect through creativity. It also makes a good waiting game at restaurants and doctor’s offices. How to make and use DIY salt puffy paint with kids. This is a tried-and-true favorite process art material and technique for children of all ages. 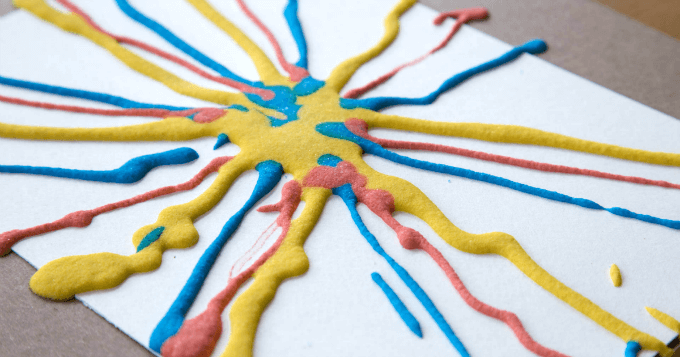 More than 15 creative playdough ideas for kids, including making fantastical creatures, using poke-ins, trying playdough mats, forming letters, and pretend play. Marble painting for kids is an easy and fun action art activity that results in a wonderfully abstract work of art. You can also do this with balls, water balloons, and more! 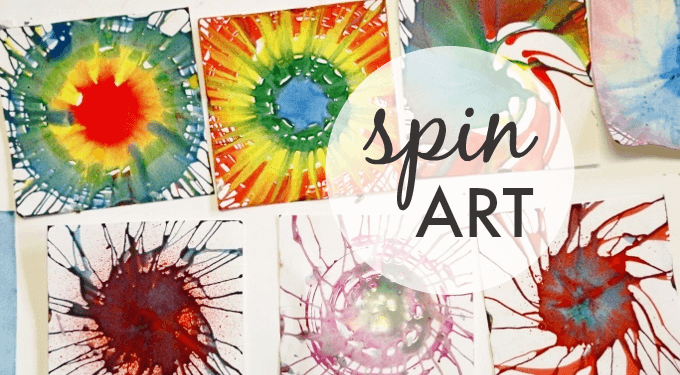 Spin painting is a favorite kids art activity that can be done with a salad spinner or with a kids spin art machine. A comparison of the two methods plus ideas for what to do with all the spin art. How about you? What’s on your list of top 10 all-time favorite art activities for kids? By the way, if there are some art activities on the list above that you haven’t tried yet, I promise you they are good ones that are worth exploring with your kiddos. And if there’s something on that list that you have done, perhaps it’s time to revisit it? I have a question, when making puffy paint instead of using regular flour could you use some other glutin free flour? My granddaughter can’t be around glutin. Probably, Becky. Why don’t you give it a try and see how it works? I haven’t tried it myself but I would love to hear back from you if you test it out. I have such fond memories of marble painting as a little kid! Our kids love the salt painting, we have done it several times this year. One other painting activity I love it taking a large piece of paper, folding in half, and on one half, either tracing a design in pencil (just a doodle, or maybe half a heart or butterfly), or freehand drizzle tempura paint in an abstract design–then folding in half for a Rorschach effect. I did this for hours at a time as a child, and was always delighted with how the drips and drizzles transformed into mirror-image abstract art. Especially fun when using primary colors, or a combo or colors with white, and seeing how the colors blend! Yes! We love that, too, Kirsten! I’ve always called them “blottos.” I think because that’s what MaryAnn Kohl calls them in one of her kids art books. I went through your posts and those were amazing! Point numbers 3,4,& 5 were really interesting, that made me like the post. Hey “Dazed”en. If you don’t like it you should keep your worthless comments to yourself. I just happened along and found this and was getting some great ideas then I came along your comments. I’ll bet people just love hanging out with you. Maybe it was you that wrecked the projects for the kids. Lots of fun to try. Thank you! 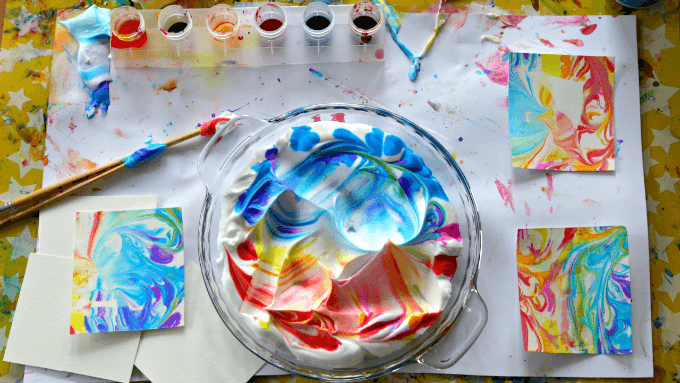 We also love the shaving cream marbling and spin art. We love the oil resist painting, watercolor spray painting, sand casting, and art hats! I follow your page, read your books from cover to cover, and refer everyone I know here. Thank you for your efforts in creating easy instructionals for parents. These art activities are truly fun to do with kids. It is important to nurture a child’s creativity. If you want to teach them these art activities, you should provide them with tools. Check out our store: https://hathart.com/shop/. Love the list. Great fun stuff for kids. Thanks for sharing.